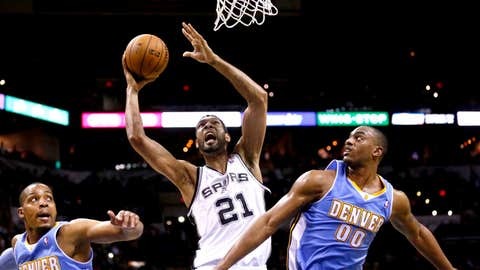 Tim Duncan (21) finished with 20 points, 8 rebounds and 4 assists. Marco Belinelli scored 27 points, Tim Duncan added 20 and the San Antonio Spurs extended their winning streak to 16 games by beating the Denver Nuggets 133-102 on Friday night. Reserve Patty Mills had 16 points for the Spurs, who scored a season-high in points. This is their longest regular season win streak since reeling off 17 straight from Feb. 29 to March 31, 1996. San Antonio also maintained a three-game lead for the top seed in the Western Conference. It’s a quick turnaround for the Spurs, who host New Orleans on Saturday. Randy Foye scored 20 for a banged-up Nuggets squad that lost for the fourth time in five games. Wilson Chandler was out with a strained groin, while Timofey Mozgov and Kenneth Faried were hampered by an illness. Faried still finished with 18 points and 13 rebounds. Belinelli stepped into the starting lineup with Danny Green hobbled by an inflamed right foot and quickly found his rhythm. Belinelli scored 14 in the first quarter. He finished 10 of 15 from the field. Coach Gregg Popovich insisted before the game that he’s not going to overextend his players to secure the No. 1 seed in the West. His goal is to keep them "as healthy and energetic as possible at this time of year." Popovich didn’t have to worry about taxing his team too much in this one, building a 25-point lead midway through the third quarter and resting most of his starters for a majority of the fourth. Even in the lopsided win, Popovich found a teaching moment late in the third. His team relaxed on one possession and allowed an easy transition basket by Foye. Popovich quickly called timeout and voiced his displeasure to his team. Popovich isn’t exactly the biggest fan of long winning streaks saying, "Maybe this comes too easy. Losing is not a bad thing at this point of the year." Trailing 20-14 in the first, the Spurs closed out the quarter on a 17-3 run. The Nuggets couldn’t rally back into the game, like they did Wednesday in San Antonio when they trailed the Spurs by 24 only to make it close down the stretch, before falling 108-103. In this contest, the Spurs kept the Nuggets off balance with their ball movement. They finished with 37 assists, including seven by center Tiago Splitter. For the remainder of the season, Popovich plans to give Duncan & Co. rest as he sees fit. "Doesn’t matter if it’s the best team or the worst team in the league," Popovich said. "It’s all got to do with the minutes that have been played and where we are, what the schedule looks like — games and travel-wise. Just make the best decisions I can." NOTES: The Spurs kept Matt Bonner (strained calf) at home because, "he wasn’t going to play anyway," Popovich said. … Asked if he would like to see the NBA reshuffle the seeds in the playoffs after every round, Popovich said: "It doesn’t do any good for me to think about what I would like. I don’t waste any time on that stuff." … Nuggets F Jan Vesely (bruised rib cage) was back on the court after missing two games. He finished with five points. … The Nuggets trailed by as many as 35 points.